The Audio-Technica AT2022 X/Y Stereo Microphone is designed to capture instruments, ambiance, vocals and performances in stereo. There are two cardioid swiveling capsules that can fold flat for storage and transportation. Easily position the capsules to allow for narrow or wide stereo operation. A low frequency roll-off switch minimizes noise due to proximity effect, ambiance, wind and more. The AT2022 is battery operated (only) and includes a cable, stand clamp and windscreen. Note: The AT2022 is designed for battery operation only. Do not attempt to use when phantom power is present. Possible damage to the microphone may result. Maximum Input Sound Level 122 dB SPL, 1 kHz at 1% T.H.D. WARNING: The AT2022 is designed for battery operation only. Do not attempt to use when phantom power is present. Possible damage to the microphone may result. Box Dimensions (LxWxH) 9.8 x 9.6 x 3.0"
AT2022 X/Y Stereo Microphone is rated 4.6 out of 5 by 7. Rated 5 out of 5 by David from Quality and Fidelity...Wow, Nice Job AT! I toiled over getting this new AT2022 or the Rhode NT-4 but decided on this for the money. I figured the NT-4 would be too big and bulky. It also wouldn't sit inconspicuously in the back of the jazz club while I play on stage so in my books, this unit gets all the high marks for the black form-factor and then, it's just beautifully made. It feels like a REAL mic in your hands even though the picture makes-it look kind-of plastic-y. In comparison with other mics in this range, I've personally never used (or listened to) the NT-4 but, all I can say is the fidelity on this AT2022 is just incredible, especially for the money. I mean, I recorded a drummer and myself on Tenor Sax playing in a warm, acoustically-foamed room with the two of us just standing next to each and the recording sounds like the kit had a 8-pc mic set-up in an decent recording studio. Then, it's also VERY versatile for all my cameras too. Audio Technica has a real winner here on their hands IMO, waaaaaaay better than my old Sony ECM-MS908C and much better than the on-board mics on my Tascam DR-07 mkII. Finally, someone is making a real stereo mic for these mini-recording sessions I love doing. Just get this mic and a 16/24 bit recorder like Tascam's DR-07 mkII or similar(or just a camera) and you're set to start making some real quality recordings. While I certainly wouldn't rule-out getting or trying-out and comparing the NT-4 as well, I know that I'll always have this mic in my gear bag. Rated 5 out of 5 by cspada from Impressive!!! I got the AT2022 primarily for stereo field sound capture in independent video productions. It has also proven useful for capturing stereo voice at close distances in controlled settings. The all-metal construction and finish is of the highest quality and the mic is rugged enough for extensive field use. The pivoting condenser capsules float on their own dense rubber collars, but are solidly attached and positively lock into 90- or 120-degree pickup and flat storage positions. The mic is surprisingly compact and has a comfortable heft to it that's not overbearing. The mic's performance is outstanding, especially considering the price. Sound quality is clean and crisp, with excellent separation of channels. The switchable low-frequency roll-off feature functions beautifully. A-T includes a fuzzy windscreen that encloses both capsules. I was initially a bit skeptical about how effective the windscreen would be, but after some trial runs and real-world use in the field, I found the performance to be satisfactory. The only downside to this mic is that it operates on 1.5v AA battery power ONLY -- not a major shortcoming for my purposes. Mic output is a 3-pin XLR male connector, and the supplied 0.5 meter cable terminates in a XLR female connector and a 3.5 mm TRS connector, so an XLR cable extension and/or a 1/8 - 1/4 adapter pin might be something to consider adding to the kit for this mic. Rated 4 out of 5 by Sal in DC from Great subsitute for onboard DSLR mics Compact size, great sound, critical addition if you want to shot video with pro quality sound. Rated 4 out of 5 by uberaudio from Great for field recording It's nice to have a stereo microphone that fits in my blimp without having to squeeze it into the clips. The Rode NT4 is a bit thick to fit into the standard clips. It's also nice to choose from the different angles (90 or 120). Rated 5 out of 5 by Radim from Rozsirený Tascam TM-2X o ultra hluboke frekvence Vynikajici mikrofon pro univerzalni pouziti v interierech i exterieru. Ucinna vetrna ochrana (mnohem lepsi nez u TM-2X), se kterou udelate velkou paradu v terenu i pri silnejsim vetru - napriklad ciste zachyceni zvuku blizici se boure nebo preklapejich se vlny na mori . Na barech a diskotekach ocenite plnost zvuku a to i u nejnizsich frekvenci, takze se skvele hodi jako mini pomocnik pro zachyceni atmosfery v plnem frekvencnim rozsahu. Rated 5 out of 5 by Radim from kompaktni a vykonny stereomikrofon Pro narocne uzivatele, kteri se nespokoji s plechovym zvukem, ale pozaduji plnohodnou frekvencni odezvu. Dalo by se rici, ze se jedna o Tascam TM-2X rozsireny o basovou slozku a mirne silnejsimi vyskami, coz z nej cini skvelou zbran na koncerty i do terenu pro studium zvuku vseho druhu. Rated 4 out of 5 by Roger L. from Good sound. XLR = stereo, not bald signal or phantom power. I record community theater and orchestra as a second job. No formal AV training, but Im geeky (R&D engineer by day), and a lifelong audiophile. The sound quality from this mic is at least as good as anything else I use*, and probably better. The XLR connector is misleading. Its three leads are: right/left/ground, not mono/180°/ground. The provided cable -- 18.5 flexible -- ends in a 3.5mm TRS stereo jack. Experts say that for such short cables, any EM interference (from the cable acting as an antenna, picking up ambient EM waves as audio noise) is too minor to notice or worry about. I wish this had an an LED to indicate battery on and/or health (minus one star for that). But batteries seem to last forever in it, so if you change the battery at the start of even a LONG day of shooting, and just leave the mic on, you will not run out of power. Ive left it on by accident for 24-hours, and it still had plenty of battery power left (I removed the battery and put it in a tester). (Id almost give the star back for that, but a battery/on LED is such a basic feature to omit.) The storage bag is decent, but so far Ive kept the product packaging foam -- which is nice grade foam, and is perfectly die-cut to cradle the mic -- as the ideal storage (I just need to trim it down a bit, so its not so huge). This mic seems ideal for run-&-gun video work, to capture reasonable directed sound (cardiod), with spatial information (stereo), and at a good quality. (I need to find a good shock mount cradle for such use, since in general I hate camera handling noise from any camera-mounted mic.) __________________________________ * Sure PGA81; Rode Stereo Mic Pro; Rode Pro [short shotgun]; Zoom H5 capsule mic; some unknown theater house mics; ... so, my comparisons are not hard-core recording studio gear, but above consumer-grade. Can you use this mic on a PC for recording outside ? Yes, but I would reco spending the money to get a real pair. Is this mic good for indoors? 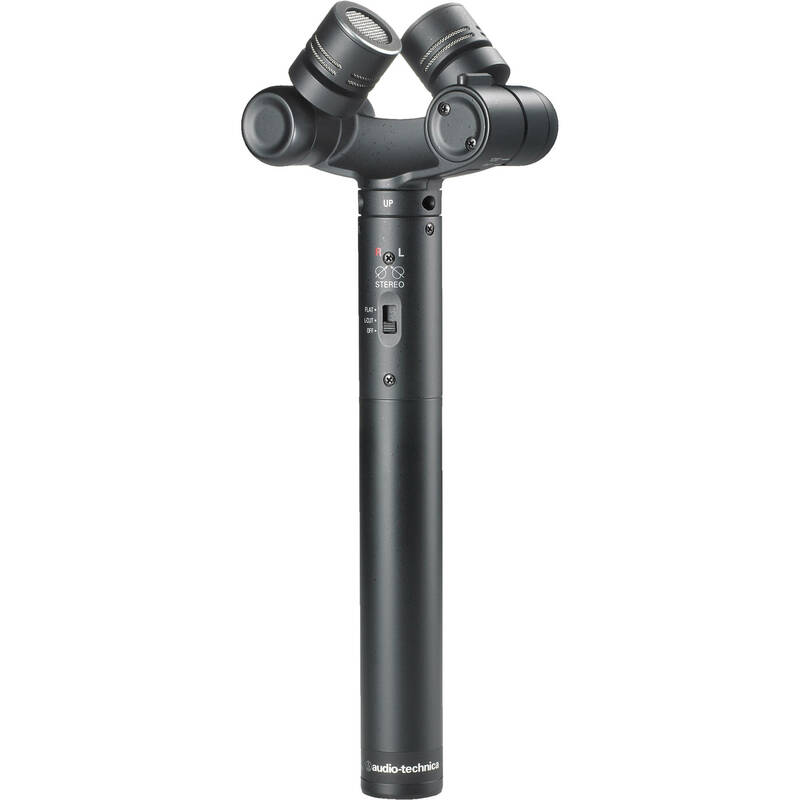 The Audio-Technica AT2022 X/Y Stereo Microphone can be used indoors or outdoors. It is designed to capture instruments, ambiance, vocals and performances in stereo. Being a stereo condenser it is probably better off inside than outside due to possible damage from the elements. Would this microphone work for two to four people talking at a table indoors? Yes it should work fine for your intended purpose. Just make sure you position the XY configuration of the capsules pointing towards your subjects.